HomeComic NotesComic NewsStrangers in Paradise Comes To Thrillbent! Strangers in Paradise Comes To Thrillbent! 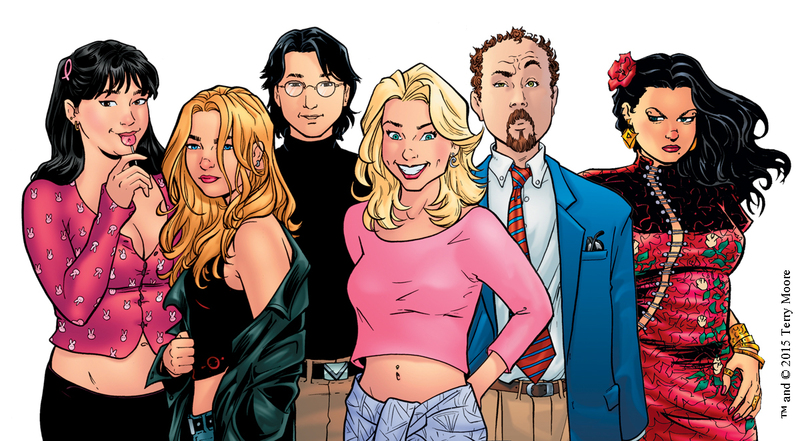 Award-winning writer/artist Terry Moore, creator of Strangers In Paradise, one of the medium’s most acclaimed and honored comics series, brings his long-running masterpiece to Mark Waid and John Rogers’ Thrillbent digital comics site beginning Friday, July 3. Strangers In Paradise’s 107-issue epic, a groundbreaking romantic thriller focused on the complex relationship between its two female leads, won the Eisner Award in 1996 and the GLAAD Award in 2008. It will be serialized weekly over the next two years from its very beginning for Thrillbent subscribers as part of the site’s continually updated library of content from comics’ top creators. There, Strangers In Paradise joins Mark Waid and Barry Kitson’s Empire(returning July 1), James Tynion and Jeremy Rock’s The Eighth Seal, Alex De Campi and Christine Larsen’s Valentine, Seanan McGuire and Erica Henderson’s The Best Thing, and dozens of others groundbreaking series and short stories. A leader in online digital comics content, Thrillbent offers a constantly updated back catalog of exciting new creator-owned comics, specializing in horror, science-fiction, comedy, and young-adult fantasy. For the price of one monthly print comic, subscribers can deep-dive through Thrillbent’s library through its web portal Thrillbent.com or through its iPad app, where new installments of its serials Empire, Albert the Alien, Spacebat and many others are updated weekly. Look for additional Thrillbent announcements by visiting www.thrillbent.com and by following Thrillbent on Facebook and Twitter @Thrillbent. For more information, email info@thrillbent.com. Thrillbent was founded in 2012 by award-winning comics writer Mark Waid and celebrated entertainment creator/producer John Rogers, co-creator of TNT’s LEVERAGE series. Currently, the site hosts hundreds of online comics of all genres and is a pioneer in creating exciting new techniques for showcasing comics and graphic novel content. One of comics’ most beloved and acclaimed creators, Terry Moore began his career in 1993 writing and drawing Strangers In Paradise, which concluded in 2007 but whose delightful characters have returned in SIP Kids. Moore has continued his success with Abstract Studio’s sci-fi thriller, Echo and his current horror series, Rachel Rising.